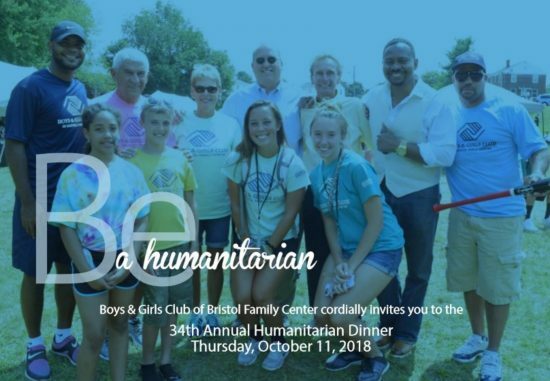 Join us in recognizing individuals for their dedication, sacrifice and accomplishments in Humanitarian Service to the Greater Bristol Community during the 34th Annual Humanitarian Dinner on Thursday, October 11th at the Double Tree by Hilton in Bristol, CT. Event proceeds to benefit the Boys & Girls Club of Bristol Family Center’s outreach unit located in Bristol’s Cambridge Park public housing complex. The Club’s Cambridge Park Clubhouse has been serving young people from disadvantaged economic, social and family circumstances since 1998. The Club is dedicated to ensuring that our community’s young people have greater access to quality programs and services that enhance their lives and shape their futures. Tickets are $60 per guest and can be purchased via http://www.bbgc.org/humanitarian-dinner or by calling 860-540-3142. Sponsorships are also available! © 2019 Bristol All Heart. All Rights Reserved.